Launch of the new tourism product: “Mobile Cooking Romania –Gourmet events at spectacular places”Brasov/ Buzau 17 January 2011 “Mobile Cooking Romania” – a joint project of several Romanian tourism development associations- is an innovative tourism product that combines sightseeing of spectacular places with cooking and tasting of culinary treasures of the Carpathian garden. “Mobile Cooking Romania” offers thematic gourmet cooking classes and “haute cuisine” events with international experienced chefs and sommeliers at the most spectacular places in Romania, like castles, fortified churches, in the vineyards or on the Danube. The idea behind “Mobile Cooking Romania” is to attract new tourists with a first-class culinary tourism programme. A special mobile kitchen device and transport system allows offering events at extraordinary places, i.e. medieval cooking experience in castles, fish preparation on a boat in the Danube Delta, cooking with wine in the vineyards of Dealu Mare or outdoor cooking adventures in the forests of Buzau. “Mobile Cooking Romania” includes more than 20 spectacular places in Romania, like Bran castle, Cantacuzino castle, Fagaras Fortress, several Saxonian fortified churches or the Living Fire in Lopatari. “Mobile Cooking Romania” has been designed for all tourists interested in haute cuisine, but especially for expatriates, international tourists and companies that are searching for exceptional teambuilding locations and events. “Mobile Cooking Romania” offers monthly show events with a seasonal cooking theme for a larger audience and a standard programme for groups of more than 6 persons which can be booked individually. The cooking events are combined with extra activities depending on the location, i.e. truffle hunting, mushroom picking, cheese making workshop or guided sightseeing tours. 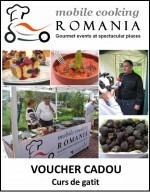 One of the first show event of “Mobile Cooking Romania” will take place in the atrium of Bran Castle in March 2011. The event starts with an introduction into the medieval cooking world, followed by a medieval cooking workshop for all participants, a wine tasting with a professional sommelier and a medieval show.